Floor Modules are designed for office and data equipment room applications. 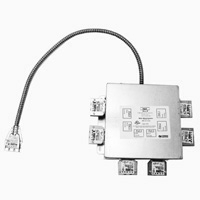 These versatile outlet boxes provide flexibility for power, voice and data connections. The modules are located near the workstations. The RELOC wiring systems can easily be reconfigred based on the changing needs of a buisness. The Secondary Distribution Box (DBS) is used with the Primary Distribution Box (DBP) to further distribute circuits to utilization equipment. Provides separate compartments for data, communication and power in an access floor. When prewired with a RELOC interface, relocation of office work stations is as easy as moving partitions and floor panels. Click here for a technical sheet. Used with the Primary Distribution Box to further distribute circuits to utilization equipment. The Secondary Distribution Box serves as a modular junction box to allow splitting circuits between multiple Reloc ports. 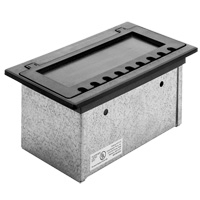 Available in two sizes, the Secondary Distribution Box can be used in an open ceiling, above a hung ceiling, and below a raised floor, including low-profile raised floors. The DBS is provided with an integrated RELOC® Dropcable attached at the input and all ports and conductors labeled to show their circuit assignment. Click here for a technical sheet.